Local officials and governments always struggle with the question of what to do with owners who do not clean up after their dogs. A council in Gloucestershire county in England is taking a different approach. They are marking the “mess” with a ring of wash-off paint to highlight the problem and to get owners to feel ashamed for not cleaning up after their dogs. The council is saying that the program is so far successful. Some residents disagree and say that it could pose as a health hazard because the waste is not thrown away and just sits there. 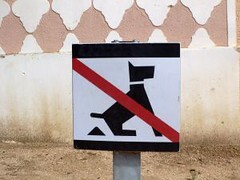 Well, at least you’ll be given more of a warning when you’re about to step in some dog poo. This entry was posted on Monday, May 7th, 2007 at 3:57 am	and is filed under Dogs, National Dog, Cat & Pet Info, News for Cats, Dogs & Owners. You can follow any responses to this entry through the RSS 2.0 feed. Both comments and pings are currently closed.